This is traditionally called “Good Shepherd Sunday” because of the Gospel narratives (from John 10) read each year, in which Jesus talks of himself as the Good Shepherd who lays down his life for his flock. A general “theme” to the Scriptures is the person of Jesus and what he has achieved by the Paschal Mystery (his dying and rising): the first reading talks of his name, and the power of the name of Jesus to save: one of the results of the “power of this name” is that in him we are all God’s children, and are promised an eternal reward. All this is summed up in the Gospel, in which Jesus talks of himself as the real shepherd, who is prepared to do anything for his flock, even to the point of giving his life. This he said before his passion, but in Eastertide we read it with the benefit of hindsight. His words are true, and by his dying and rising he has truly saved his flock. Back to Saint Peter again! This time he is speaking in his own defence after the healing of a man “by the name of Jesus Christ”. The key to your tone in reading this passage comes in Peter’s line: “I am glad to tell you all...” Peter is happy to tell people of Jesus’ name and the power that his name gives: this is an opportunity to witness to Jesus, and Peter wants nothing more. So your tone should also be glad, encouraging and joyful. This reading is quite straightforward, mainly because it announces the context in the first few lines: Peter says why he is making this defence: make sure this comes across clearly, so that your listeners know why Peter is talking about Jesus. Do be careful with the central sentence - it is rather long (from “If you are questioning...” to “... in your presence today.”): so think about your pauses beforehand, so that you don’t get lost in the middle of the sentence (and your listeners along with you.) Also note that in the last sentence Saint Peter is quoting from the scriptures (actually from the Psalm which follows) - this would have been familiar to those listening to him, and he uses it very deliberately: do so yourself. Save a little extra enthusiasm for the last sentence, especially the word “only”. Second Reading: 1 John 3:1-2. A very short and familiar reading, but one that contains a vast amount of encouragement and comfort for us all. It also contains a great sense of awe at the mystery of God’s love and care, and great faith in an unknown future. The reading starts with an invitation to the congregation to “Think...” The reader’s tone of voice and phrasing should help encourage people to do just that: perhaps pause for a second after “...God’s children”, to let people think, and then come in with “...and that is what we are.” There should be a marvellous warmth in your voice as you unfold John’s vision of our future: we shall see God as he really and, and, wonder of wonders, we shall be like him! A reading to enjoy - both proclaiming and hearing! "The Good Shepherd is one who lays down his life for his sheep." 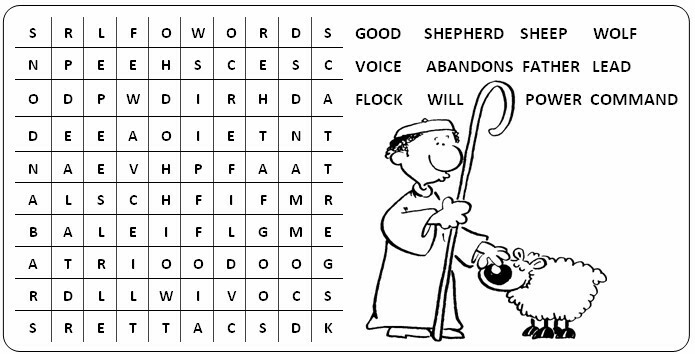 Click on the link to get this Wordsearch. Feel free to copy and paste it into your parish publications.